On the road, going to a home supply store for plumbing stuff, replacing water pipes in my shack. I passed a little squirrel laid out on the pavement and thought, poor little guy survived winter to end up being road-kill. I took care of my needs at the store, as I approached the scene of the hit-and-run, I could see a rather large animal in the road where the squirrel lay. What have I run into this time? Up and into a near by tree, this large bird flew. As I passed I could ID the bird as a Turkey Vulture. Each year they show up at this time of year. I've seen them soaring on the thermal up-drafts but to see one on the ground is a rare sight. A large bird with a wing-span of six feet, the Turkey Vulture (Cathartes aura) range from southern Canada to the southern tip of South American. They feed almost exclusively on carrion, dead animals, which they find with their extremely sensitive sense of smell. The turkey is one of only a few birds that can smell. The Genus name Cathartes is the Latinized form from Greek meaning "Purifier". After all, the Vulture's place in nature is to consume the dead before putrefaction sets in, many deadly bacteria are killed by the Turkey Vultures digestive system. Look at that face, don't you love it, well I do. My favorite bird of all. 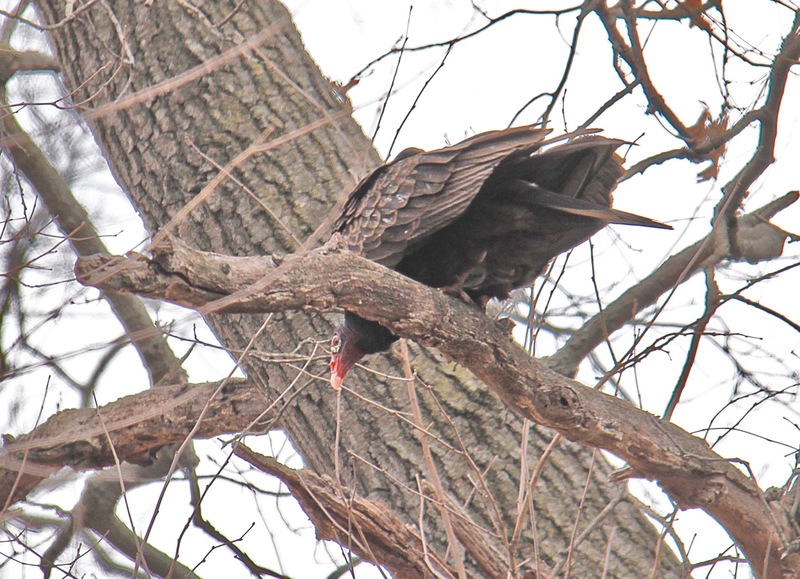 The Turkey Vulture is the only bird that does no harm to any other animal. 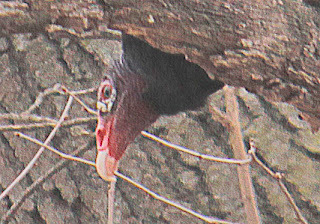 They don't harm bugs, worms or fish, the Turkey Vulture should be the symbol of world peace and environment purification. Can I get an Amen!